The chaotic weather pattern over Sri Lanka continues to wreak havoc — with the South West monsoon lashing one half of the country in an extended stay, while October’s much-expected inter-monsoonal rains are yet to make an appearance to end the drought in the other half. The Meteorological Department said the low pressure condition that had developed in the Bay of Bengal was delaying the onset of the inter-monsoonal rains. Duty Meteorologist Dharshana Premathileka told the Sunday Times the conditions were still not conducive for the second inter-monsoonal rains to come. Usually, inter-monsoonal rains are experienced island wide in October and November. During this period, the country receives heavy rains within a short time span. The Met official said the department was hopeful that at least by the end of this month, the country would experience the inter-monsoonal rain to see an end to the prolonged drought in the Northern, North Western, North Central and Eastern regions and the Hambantota district in the Southern Province. 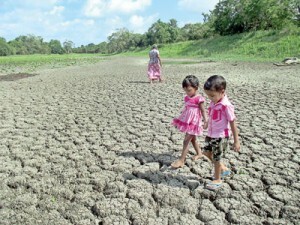 Meanwhile, All-island Farmers Federation National Organiser Namal Karunaratne said the livelihood of agriculture-dependent people in these areas was affected not only by the prolonged drought but also by the lopsided policies of the Government. Although it rained occasionally, the irrigation tanks were still largely empty and therefore the farmers could not start cultivation, he said. Hitting out at the Government’s water distribution policy, Mr. Karunaratne said it appeared that agriculture was not a top priority in the allocation of water. The agriculture sector received only the remnants after much of the water was distributed for hydroelectricity generation, drinking water and to the industrial sector, he said. “To generate electricity, there are many alternatives, but the agricultural sector has no alternatives if there is no water,” the farmer leader said, calling on the Government to review its water-distribution policy. Speaking for paddy farmers in Moneragala, Thanamalwila, Wellawaya, Buttala, Bibile and other nearby areas, S.P. Sirisena said that with their harvest failing, most of the farmers were in a desperate situation. He said most irrigation tanks were dried up and as a result, whatever farmers had cultivated yielded little or no harvest. Meanwhile protesting farmers in these areas complain that the Rs. 10,000 a month compensation that the Government agreed to pay from January for drought-affected farmer families have not reached them. Only a few farmers had received compensation, the farmers said, vowing to continue their protests. P.A. Keerthisinghe, a paddy farmer from Sevanagala, said his harvest had decreased drastically and no Government institution had come forward to provide relief to him. He said the loss the farmers had incurred as a result of the harvest failure and the damage to their water pumps was unbearable and the Government should at least pay as compensation 50 percent of what the farmers had lost. 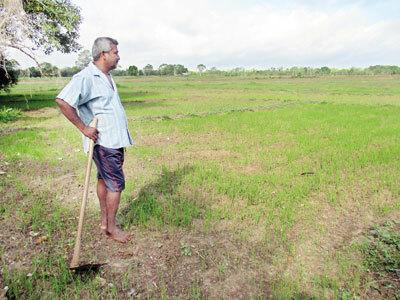 All-island Farmers Federation National Organiser Namal Karunaratne has alleged that the Government is using the drought as an excuse to import rice.He said the country had 800,000 metric tonnes of rice in stock to meet four months’ demand. “True, we have not received much paddy from the Yala season cultivation, but the existing stock is sufficient to meet the country’s rice requirement of 200,000 metric tonnes a month,” he said.